This is a page about how I came to write it and what my thoughts on it are. If you are not interested in this then skip right ahead using the links above. 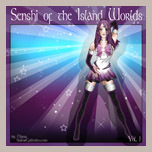 Just like most Sailormoon fans, I too created my own otaku (fan) senshi. At first I just played around with a colouring image of Sailormoon, changing the colours and hairstyle. But having read about the likes of Sailor Orion and Sailor Sirius I decided I wanted more definition to my own otaku senshi. I was very much into astrology at the time (still am but even more so back then) so I looked for planets and asteroids with names I could use. I instantly liked the name Ida. So I searched the Encyclopedia Mythica for the name and found that she is "The Hindu goddess of prayer and devotion" - that gave me all the inspiration I needed to finalise Ida's character. The choice of making her an asteroid senshi was also an obvious one, because Ida is one of the largest asteroids in the asteroid belt. But I got bored of her fairly quickly and a new character was developing in my mind. And as it happens when you get bored of one thing you tend to want the complete opposite. While Ida was representing all the lovely and sentimental character traits I could think of I wanted a more controversial character. Eissa was born. She was rebellious, brutally honest and a party animal. And she had to be older than Ida. She was attractive but unaware of that fact. She was not arrogant. And while I was defining Eissa's character I started to like Ida again. Whenever I wrote down a character trait for Eissa I thought about what the relevant character trait for Ida would be. Suddenly she wasn't as flat a character anymore as she had been at the start. She now had weaknesses too and they made her human. And as more or less expected these two characters turned out to be almost complete opposites - which gave me the inspiration for the prologue. They were going to be a bit like Ying and Yang. They were like one item. And that is how I got the idea for The Link. Their powers are a challenge that I have yet to overcome while I am writing chapter 7! I don't have an awful lot of imagination when it comes to this sort of thing. But their realms of power were clear to me almost from the start. 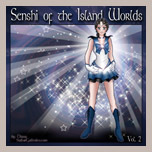 All the elements were taken already (by the inner senshi) so were the earthly realms (by the outer senshi). I was inspired by the Shadowworld settings - specifically the goddess Eissa, who was guarding the portal between life and death. This character helped develop mainly Ida, though my second senshi finally got a name (which she was still missing at the time). So Ida became the guardian of souls in life and death. With that came the ability to sense every soul in the universe (extremely weakened while not in senshi form). Then I thought of the various parts that make up a person: Soul, Conscience, Mind and Energy are the realms I came up with. The Mind didn't seem to match my idea of Sailor Eissa, and Energy was kind of suitable, though not controversial enough. So she became the Senshi of Conscience. With that came the ability to sense people's emotions and that gave me the idea for my fanfic. So what is all this bla about the "spiritual world"?